Comparethemarket has partnered with Disney to offer two new toys, to mark the first terrestrial showing of animated hit Frozen, on BBC One on Christmas Day. 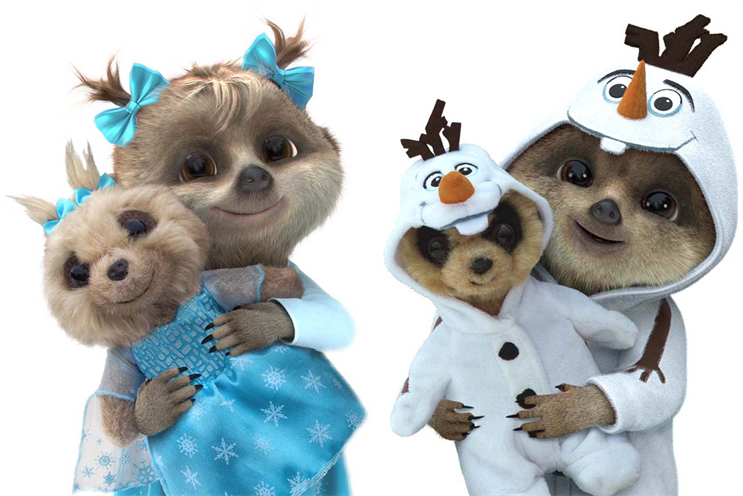 The two models are Baby Oleg dressed up as Olaf the snowman, and a new character – Oleg’s best friend, Ayana – dressed as the film’s protagonist, Elsa, in a turquoise princess dress. They are available now to existing customers that have purchased a product through the site in the last 12 months, and will be available to everyone else from 22 December. Comparethemarket is also set to launch a new Frozen-inspired ad on Christmas Day, featuring the return of Oleg, who was last seen on Christmas Day 2014 when fellow meerkats Aleksandr and Sergei said goodbye to him in Africa. Frozen, released in late 2013, grossed $1.28bn (£1.01bn) at the box office worldwide, and then became the biggest selling DVD and Blu-ray of the decade in the UK. A sequel, Frozen 2, is in development. Anna Hill, chief marketing officer at Disney UK & Ireland, said: "It shows the power of our franchise-management strategy that we’ve been able to keep Frozen front of mind three years on from the movie by creating fantastic mass market moments, such as this brilliant Comparethemarket campaign."